This sentence is not from a “counseling source.” It is from a systematic theology book I read during my seminary studies. But it addresses a question with profound counseling implications – what is the healthy human functioning towards which counseling should help an individual make progress? The word progress requires a goal. That is the difference between progress and movement. Movement doesn’t require a goal. You can measure movement by distance and speed without any reference point. However, progress can only be measured as it relates to a desired goal. Counseling is about progress, not just movement. But that begs the question: what is the goal? At one level, we could say that goal was a healthier, more enjoyable life. But, if you’ve done much counseling, you quickly realize that doesn’t really answer the question. Parents can have different definitions of “healthier, more enjoyable life” than their teenagers. One spouse can have a different perspective on a “healthier, more enjoyable life” than the other spouse. Pastors can have different definition of a “healthier, more enjoyable life” than their parishioners; and vice versa. Another potential answer is scientific consensus. The most renowned book of this nature is the Diagnostic and Statistical Manual (DSM) for mental disorders. This is where we get the standardized definitions for concepts like post-traumatic stress, attention deficit disorder, bipolar, and schizophrenia. But this book, by its own admission, merely claims to be descriptive of problems rather than prescriptive regarding alternatives. A third option is to let each person decide for themselves. But this runs into the same dilemma described in the parent-teen, spouse-spouse, or pastor-parishioner examples above. What one person defines as “a good life” often contradicts with what another person defines as “a good life” in such a way that both lives are not possible. Millard Erickson’s quotes accounts for this problem. It says this dilemma captures the essence of the ultimate malady of the human condition. When we, as individuals, wrestle with this question we assume we are untainted. We assume James 4:1-10 only applies to those who stand as obstacles to our understanding of happiness and ideal human functioning. 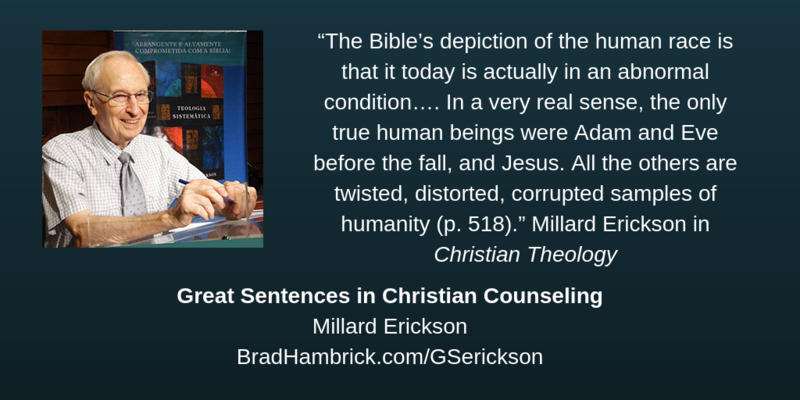 Now, Erickson is a theologian rather than a counselor. This means his calling is to define biblically faithful answers more than chart biblically faithful journeys. The relationship between theology and ministry was discussed in an earlier post in this series. But the first part of charting any journey is to identify two points on the map: where you are and where you want to be. Erickson helps us identify these two points. If the role of the theologian is to define answers or draw the map, the role of the counselor is to take the journey and a serve as an informed guide on the safari of life. This is different, but a hopefully complementary skill set. Learning how to navigate the challenges that emerge in the earliest stage of counseling – identifying a mutually agreeable goal – is harder than I thought it would be. Erickson helped me understand why it was difficult. For this I am grateful and it accounts for why this sentence has stuck in my memory.